I remember when we first met. It was my freshman year at the College of Charleston, when I was getting ready for a party that evening. A friend walked into my room and told about these Citadel cadets that were up on the hall. Oh Brudda! I love a guy in uniform, so I had to check these dudes out. These three guys had us laughing so hard! He called me a couple of nights later and we talked until 2:00 in the morning. I remember stretching the phone chord into the closet to talk to him. I think I failed the chemistry exam I had the next day…..oh the things we do for love. Nine months later he asked me to marry him! I was 19 years old and needless to say my parents weren’t too happy about the situation. 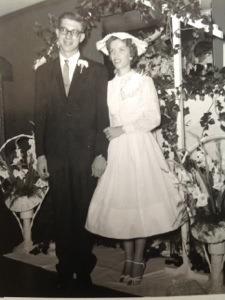 After promising my dad that I would finish school, we tied the knot a year and half later. After nine months, how did we know this was “it”? There wasn’t a checked off list or flashing neon sign saying we were meant to be, but we just knew. We were totally and completely in love. 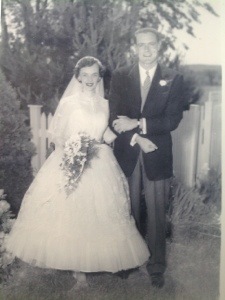 My parents were married for over 50 years. Superman’s parents celebrated 40 years of marriage. I love the local Sunday newspaper where I read about the newest brides, who was in the wedding, where they had the wedding, where the couple went to school and their jobs now. Weddings are a hot topic for tv shows- Say Yes To The Dress, My Big Fat Gypsy Wedding, Four Weddings– all seen on The Learning Channel and My Fair Wedding on the We Channel. I know there are plenty more. Then if that isn’t enough, check out Pinterest! Weddings are a symbol of hope for me. With all that’s bad in the world, I like to think that the love between these two people will last a lifetime. Love is a good thing. God created woman so man would not be alone. We are made to be in relationship with others. Usually, when saying “I do”, it means a commitment to love one another, support each other, make decisions together, care when we are sick, and to trudge through when times get tough. But as you know, this isn’t always true. In fact, 50% of all marriages will end in divorce. I get heartsick every time I hear about another couple calling it quits. 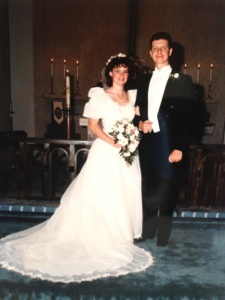 Superman and I have been married for 26 years. But let me tell you…it hasn’t always been easy. Even in the worst of times, divorce was never an option. Counseling? Yes. Divorce? No. I believe that because Superman and I have a solid relationship of love, friendship and respect, we are able to overcome any marriage obstacle. God is the head of our marriage. Some quick statistics from The State of Our Unions. I find these stats interesting. For one, I love that satisfaction is higher when couples attend religious services together. We can’t do this on our own. People are sinful by nature. We need God to guide us. Secondly, as a nation, we are always looking for ways to live longer. We eat our fruits and veggies, exercise, and pray, so why not add “keeping the marriage together” as a priority? As the statistic above states, not only does divorce affect you as a couple, children show signs of decline too. Although, we may think that it is only about the husband and wife, the failed marriage touches everyone…children, sisters, brothers, parents, friends, co-workers and neighbors. All of this scares me. Too many couples that I know are calling it quits. I am not an expert on marriage. I am a failure in so many ways. But I think I have some ideas that will help not only my marriage, but hopefully your’s too. 2. Be each other’s friend. 3. Go out of your comfort zone sometimes and do something together. 4. Pray every day for your spouse. Here is a link to help with praying for our husbands 31 Days of Praying for Your Husband. 6. Say “I Love You!” everyday. I love Superman! We are two sinful people with different ways of thinking, doing, expressing our thoughts, loving, sharing, who are bound together and committed to making this marriage last a lifetime. That whole- men are from Mars and women are from Venus is true. God created each of us with talents and personalities. We can’t forget about those special qualities that made us fall in love with each other. Let’s rejoice in our differences, thanking God for our uniqueness. Love is Good! Today’s Joy Dare Challenge is to name three gifts of fabric. I love going into fabric stores, where I slowly walk up and down the aisles touching each of the pretty rolls. Mary Jo’s Fabrics in Gastonia, NC blows my mind with the over abundance of choices. I have to be very focused if I go in there. The colors and feel of the fabrics makes my heart race with excitement. 304. Sunroom fabric. 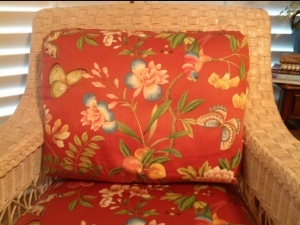 When we moved into this home 6 years ago, I needed to change the fabric on this chair. I went to my favorite interior fabric store, Martha’s, and found this beauty. This chair is where I do my devotional and journal. I call it my throne. It’s a pretty spot to talk with God. 305. Chickens. When it comes to decorating, I’m not the type to change things up every other week. I find something I like and stick with it. That’s the way it is with these curtains. 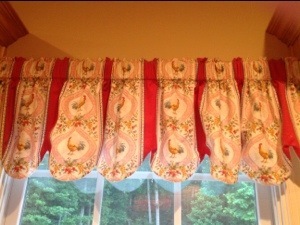 Ten years ago, I knew I wanted chicken fabric for my kitchen curtains. I knew what it looked like in my mind, then I just had to find it. Find it I did. Why is this fabric a gift? It reminds me that God gave me the gift of being able to sew. I’m proud of what I did. 306. My children’s baby blankets. 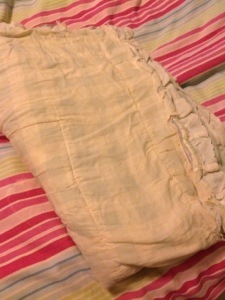 This is my almost 21 year old’s faded, tattered and torn baby blanket. Before the birth of each of my three children, I made them a baby blanket. These blankets wrapped them up, kept them warm and snuggled my kids as they grew. My daughter loves hers so much that she wanted to take it to college. Oh, how I miss those days of my sweet babies crawling in my lap, wrapped in their blankies to read a book or watch a favorite tv show. What are three gifts of fabric do you have? Let me know in the comments below!